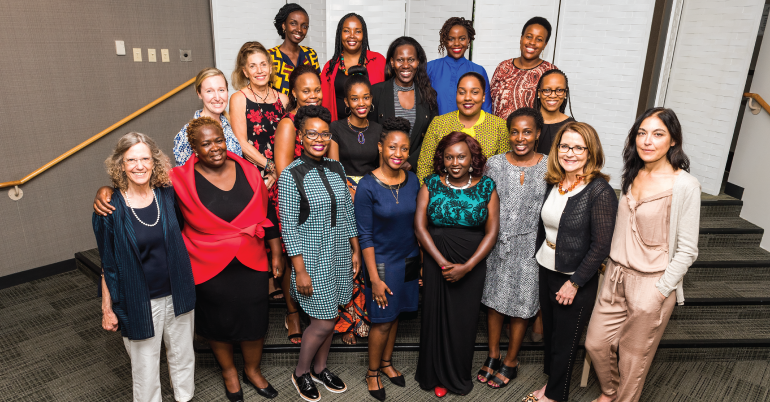 “Launch and Grow: The Kenyan Women’s Entrepreneurial Leadership Program in USA is a unique first-of-its-kind program offered to select groups of both emerging women entrepreneurs and seasoned Kenyan women entrepreneurial leaders. The Women for Africa Foundation, through collaboration with Babson College and Banco Santander, will offer a transformational and very unique learning experience designed to accelerate the impact and success of the participating entrepreneurs’ businesses. The program includes an intensive one-week residency at Babson’s main campus located near Boston, Massachusetts, the USA in addition to e-learning, coaching, and mentoring post-program in Nairobi. The overarching goal of Launch and Grow: The Kenyan Women’s Entrepreneurial Leadership Program in USA is a bold one: to bridge career stage and status to create far greater opportunities for high potential women entrepreneurs in the country to create extraordinary economic and social value. As a participating emerging business leader or entrepreneur, participants will develop an opportunity-focused mindset and an appreciation for how Entrepreneurial Thought and Action can be applied to their life and work in a variety of contexts and environments. The program emphasizes learning by doing. Concepts and theories will be quickly applied through an action learning methodology. The program offers the participants the opportunity to become a member of a Network of Women Entrepreneurs who have lived the Launch & Grow experience and are willing to share their entrepreneurial skills and to create new business opportunities. Launch and Grow: The Kenyan Women’s Entrepreneurial Leadership Program in USA will be taught by a group of leading faculty members from Babson College, the #1 institution for entrepreneurship education. The Babson faculty team is unique in its use of both academics who are thought leaders and accomplished researchers as well as practitioners who are seasoned business leaders, entrepreneurs, and investors. Just as important as the faculty’s academic and professional qualifications is their approachability and dedication to participants’ success. The participants will work closely with faculty as they coach and mentor participants. The applicants awarded with the grant will receive an 845 euro Travel Allowance. The grant will cover the expenses related to the accommodation in Babson College during the one-week intensive training as well as all the tuition fees concerning the training. The participants will work closely with faculty as they coach and mentor participants. Participants will learn entrepreneurial skills from a Network of Women Entrepreneurs who are willing to share their experience and to create new business opportunities. The program will accept applications from two groups of participants both of whom must be founders/owners/CEOs/ or Managing Directors of registered companies. The maximum number of participants, in this edition, will be 14.